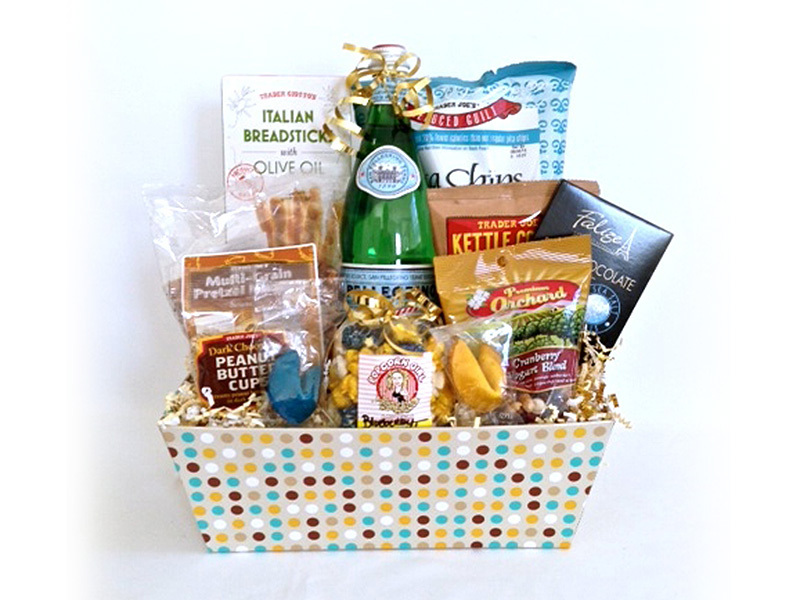 City VIP Concierge offers custom gift baskets for any occasion. We shopped and searched for the most glamorous, unique and delicious products from around the world to best serve our customers. After tasting and experiencing hundreds of items, we created a product line that showcases our personality and our desire to be the best at what we do. 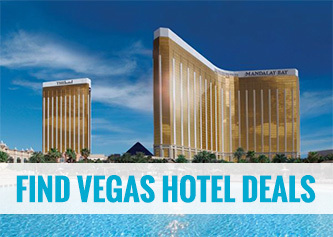 Las Vegas Strip and surrounding areas $20.00 flat fee for orders of 1-20 units and $35.00 Flat Fee for orders of 21+units. We only accept orders for customers 21+ years old. “Gourmet Lunch Boxes Are An Easy and Delicious Way To Provide Lunch For VIP Travelers, Corporate Luncheons, Conventions, Sports Teams & Family Reunions. 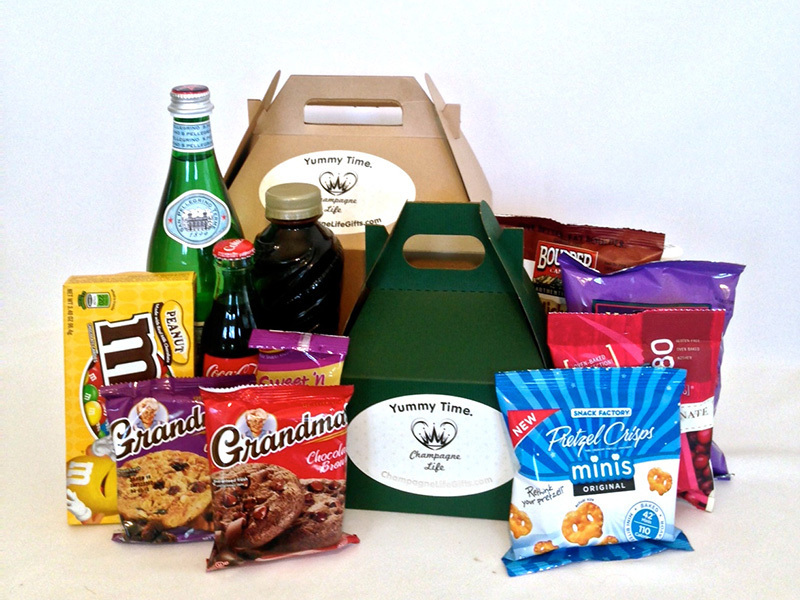 You “Build Your Own” Box By Simply Selecting Your Favorite Items. Build your own gift basket by selecting the contents that best fit your needs. Perfect for corporate gifts, Conventions and trade shows. Classy and Beautiful, Our Champagne Bucket Set Is Sure To Impress! 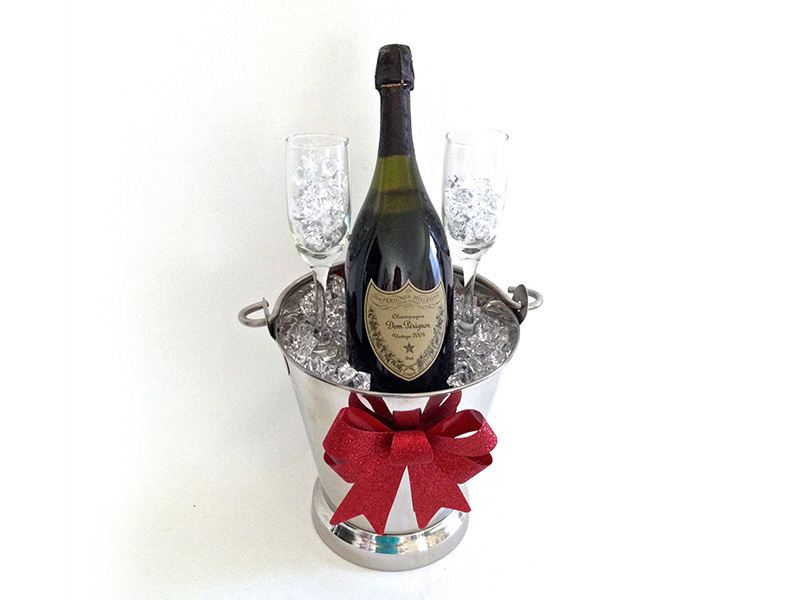 Gift Set Includes Large Stainless Steel Ice Bucket, (1) 750ml Bottle of Dom Perignon 2004 (2) Crystal Champagne Flutes and Acrylic Ice Cubes. 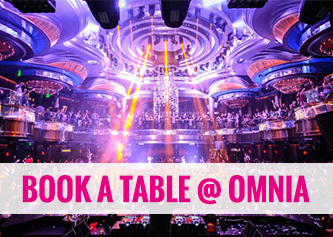 Perfect Gift for Celebrating a Bachelor Party or Guys Weekend in Las Vegas! 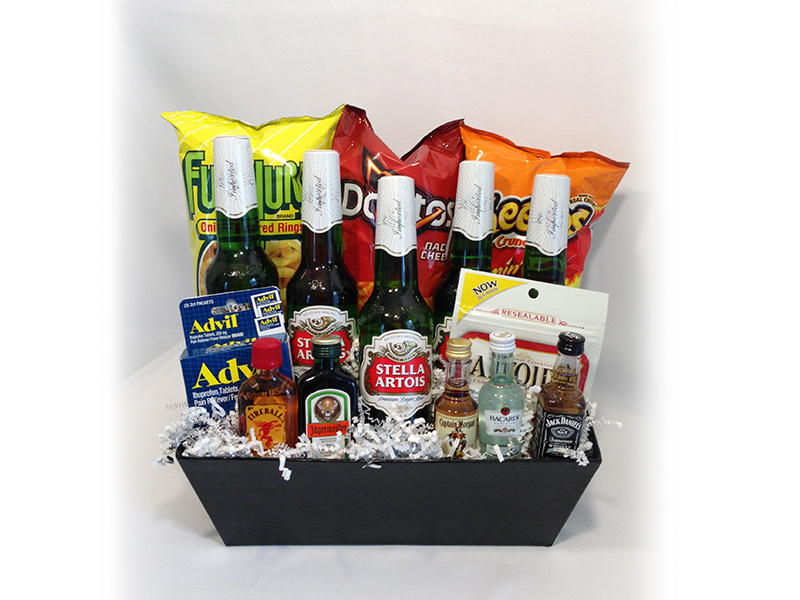 This Gift Box is Filled with Your Choice of Beer, Chips & Snacks, Jaegermeifter, Fire Ball, Bacardi, Jack Daniels and Captain Morgan. Customer selects beer option: Blue Moon, Heineken, Stella Artois, bud light, bud light – lime-a-rita, coors light and corona. The Pool Party Bacrdi Basket Equals Party Time! 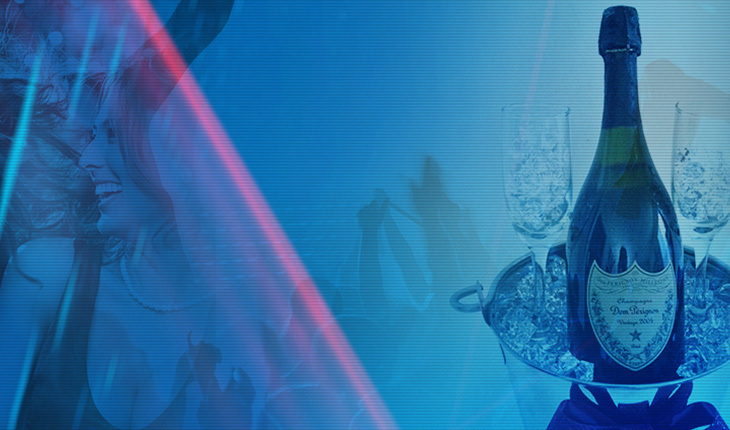 Enjoy a 750ml Bottle of Bacardi Dragon Berry, (12) Flavored Vodka Shooters, (5) Tropical Escape Drink Mixers, (2) Fun Drink Cups with Lids and more! 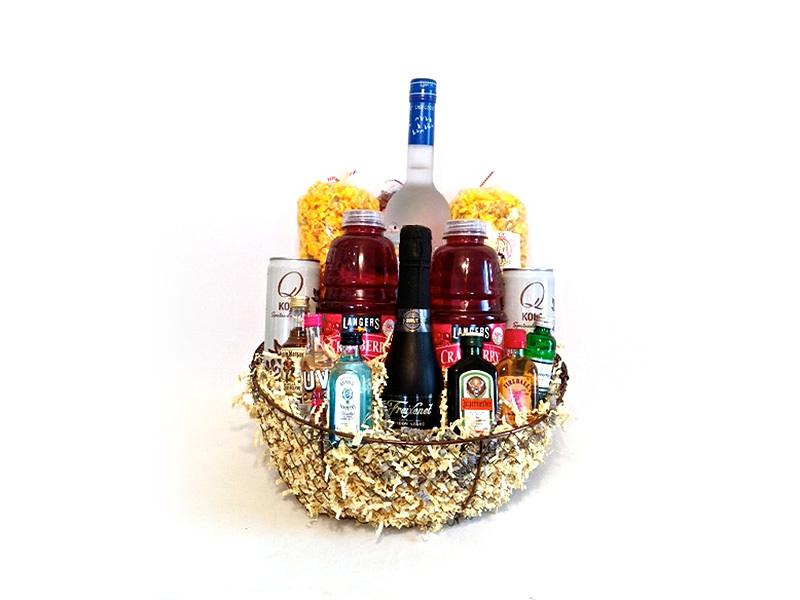 The Deluxe Liquor Basket is a divine gift that includes your choice of liquor with a variety of mixers and snacks. Featuring (1) 187ml Bottle of Freixenet Brut Champagne, chicago mix, southwest buffalo wing and mixed fruit flavored popcorn, Individual mini shooters of Bombay Sapphire, UV Cake Batter Vodka, Jagermeister, Tanqueray, Fireball and Captain Morgan. Customer selects liquor: Bombay Sapphire, Grey Goose, Crown Royal or Fireball whiskey. 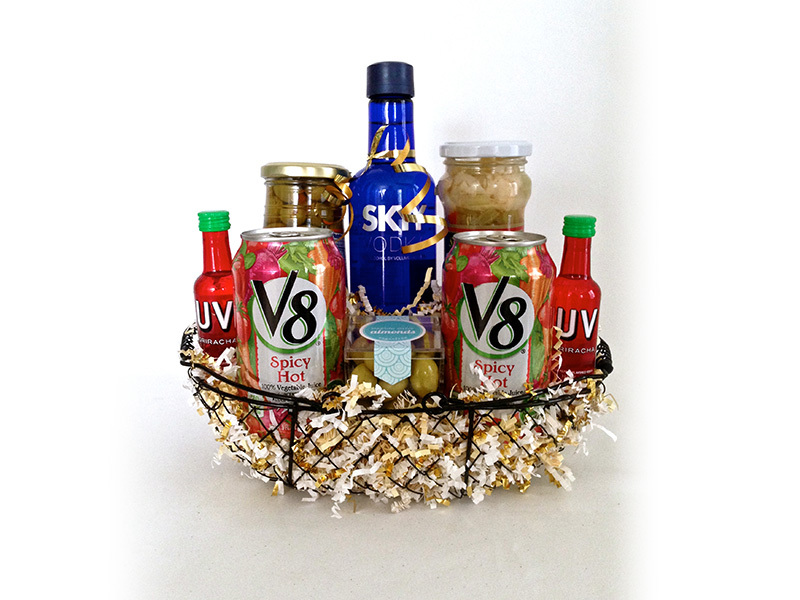 Our Bloody Mary Basket is a Great Gift For Any Occasion! Full of Everything you Need to Make The Perfect Bloody Mary! Basket Includes (2) Large Cans of Hot & Spicy V8, 375ml Bottle of Skyy Vodka, Jar of Gourmet Stuffed Green Olives, Jar of Hot & Spicy Pickled Veggies, (2) Bags of Salted Pistachios and Sugarfina Martini Olive Almonds! All You need is the Celery! 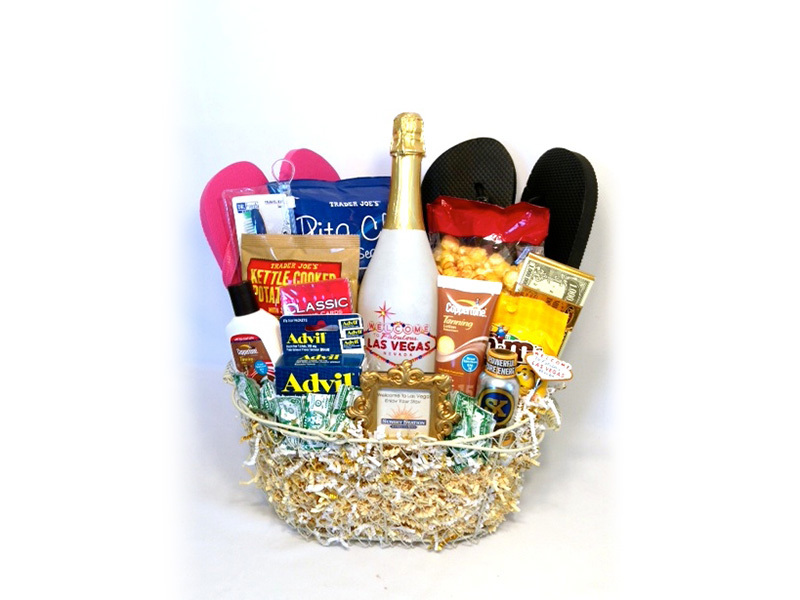 Giant Las Vegas Themed Basket Filled With Everything You Would Need To Have A Fabulous Trip To Las Vegas! Includes (1) 750ml bottle of “Welcome to Las Vegas” Moreno Sparkling Wine with Swarovsky Crystal embellishments.